In this article we’ll share some places that are unknown to most tourists, little-hidden gems that you will be able to admire while you buzz about following ‘’The Musts tour’’ and its trail of attractions. 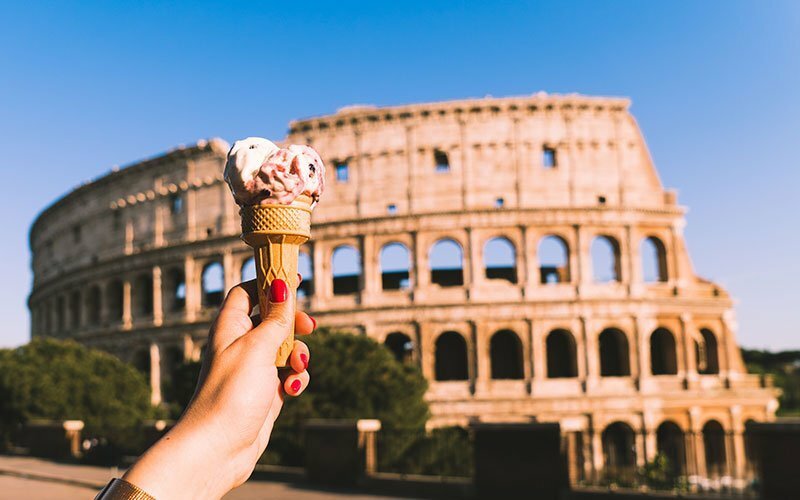 Traditional restaurants, wonderful shops, fantastic gelato parlours leading you to discover Rome “off the beaten track”, that only a few guides care to mention. Thanks to the iPad and GPS navigator provided with our cute Buzz buggies and our iconic Vespas, Buzz4tours has provided pre-set itineraries around Rome for some time now. A Fun, quick, easy and ecological way to visit the marvels of the Eternal City. 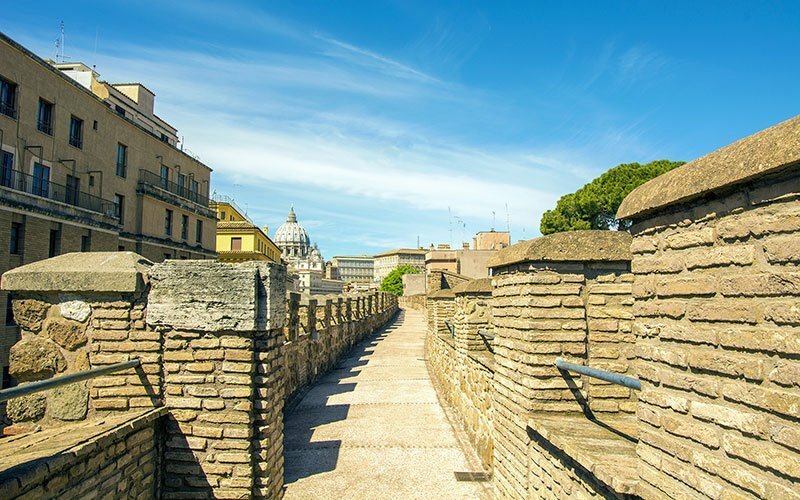 Passetto di Borgo: a secret elevated passage between Vatican and St. Angel’s Castle in Rome. The first stop on our ‘’The Musts’’ itinerary is the mighty St Angel’s Castle, but how well do you know Borgo Pio? Located just around the corner from our office, ebbed inside the XIII century walls of the Passetto, the secret passage way that runs from the Vatican to the nearby castle, it is vibrant with restaurants and artisan’s shops strewn along its narrow cobbled streets, enough to charm the most hardened of travellers. Now, are you a foody…? Good, a nice way to start the day is to taste one of the delicious cakes made by the Pasticceria il Farinone (Vicolo del Farinone 19) or try the Roman’s favourite breakfast (cappuccino + cornetto) at the La Latteria (Borgo Pio 48). 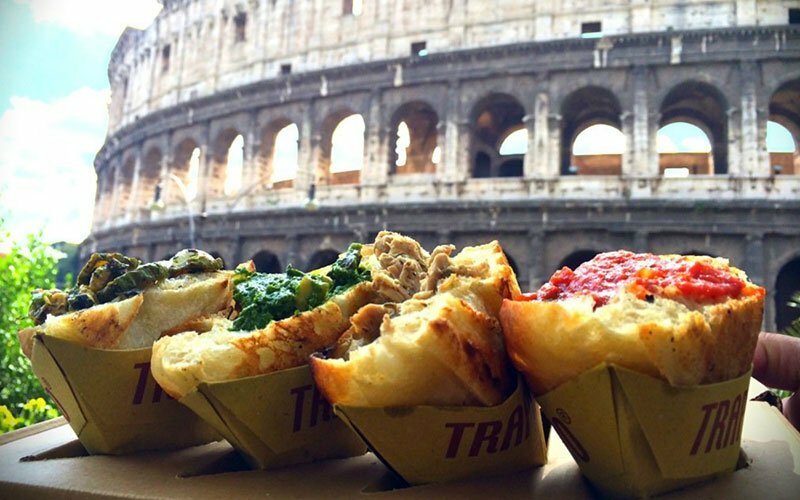 Trapizzino is a triangular pocket of pizza dough filled with classic Roman recipes. Back on board Buzz or Vespa let us continue our journey to Trastevere, the place to hang-out for the locals and not. 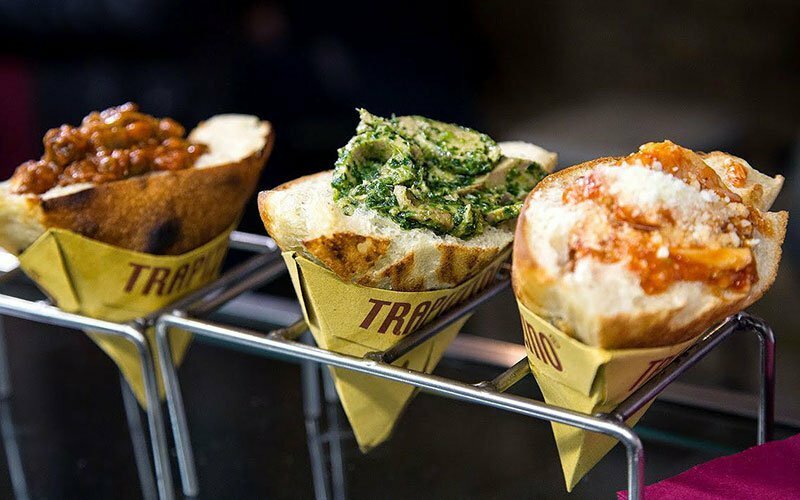 If you are feeling like something more than a snack you should try Trapizzino (Piazza Trilussa, 46). You can sink your teeth into a Trapizzino which is a triangular shaped wedge of white pizza which is filled with typical Roman food classics. The piazza can also host you for a sundowner before you move off for dinner at Enzo’s (Via dei Vascellari, 29), and have their excellent Carbonara. Trastevere is one of the Capital’s most popular districts. Discovering its alleyways is an experience not to be missed by all those who wish to plunge into Roman habits and breath the air of a Rome gone by. Right here there is a gem known only to a few. A visit to the ancient Spezieria (literally Spices shop) amongst its ampoules, fine vases, a liquor lab and XVII century furniture is definitely a “dive into the past” giving you a peak of everyday life in those days. You will find it in Piazza della Scala 23. 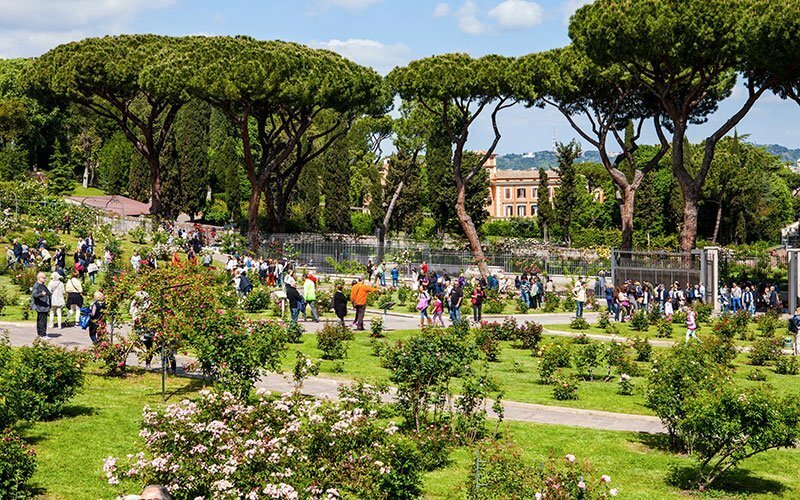 The beautiful Municipal Rose Garden is a public garden in Rome, located on Aventine Hill in Rome. Buzz will probably feel the added weight following your stop but just click on “The Magic Keyhole” on the pre-set GPS and drive off over Tiber Island to take a peek through the keyhole before a short drive back down to none other than the Circus Maximus. Not many know that, just nearby, you can admire the wonderfully beautiful Rose Garden (Via di Valle Murcia, 6). Be amazed by over 1100 different varieties of roses from all over the world. This is an absolute MUST if you are in Rome in the spring. The next few stops do not need an introduction, the Roman Forum, Capitoline Hill, and the Colosseum. Our nippy buzz buggies will get you there in no time as will our Vespa, as you pretend to be Gregory Peck or Audrey Hepburn (Roman Holidays). Having carried on to the Pantheon and feeling slightly stunned by all this ancient beauty, you may decide a gelato (ice-cream) would go down really well. “Said and done”, you happen to be near two of the better known gelaterias in the whole of Rome that stand out a mile from the many touristy places you may have happened on before. Giolitti (Via degli Uffici del Vicario, 40) and the more modern Grom (Via della Maddalena, 30a). Next stop Piazza Navona and the nearby Campo de’ Fiori – here you’ll find two very different places that will satisfy both your love of all things sweet and that for culture. These are ZUM (Piazza del Teatro di Pompeo, 20), who specialize in the well known Tiramisù, the typical italian dessert made with Mascarpone (creamy white cheese) and coffee on a bed of biscuits, possibly not very slimming but delicious… The other, is the Biblioteca Angelica (Piazza di S. Agostino, 8), a wonderful library designed by Luigi Vanvitelli that hosts some 200,000 books both modern and ancient. The Dolls’ Hospital a place where antique dolls are given new life. Photo credit: © Gary Jones. So, you may have visited the Trevi Fountain, or you have perhaps gone mad with your credit card on the four floors of the nearby Rinascente in via del Tritone, with over 800 brands from international fashion houses, or perhaps you’re sitting on the one of the famous Spanish Steps before descending on Piazza del Popolo in the very heart of Rome. Fine, now walk down Via di Ripetta one of the three roads off the piazza, and proceed to #29. 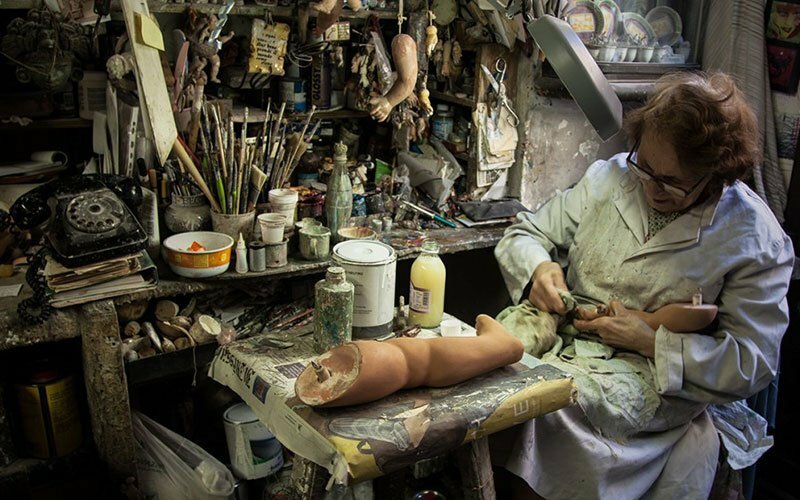 Here you will find a really strange place where time seems to have stopped, this is the Dolls’ Hospital run by able craftsmen who repair dolls, puppets and vintage toys. The atmosphere is truly unreal: not to be missed! 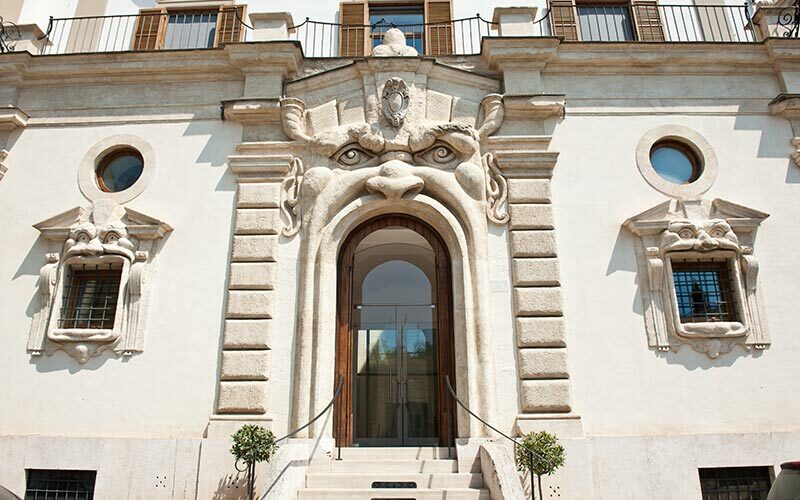 In 1904 the Palazzo was bought by Enrichetta Hertz, who refurbished it and then made it the home of a wonderful Paintings Collection and a very rich library specializing in Art literature, known today as the Biblioteca Hertziana (Hertzian Library). Art and deformity meet again in a building just off Piazza di Spagna. 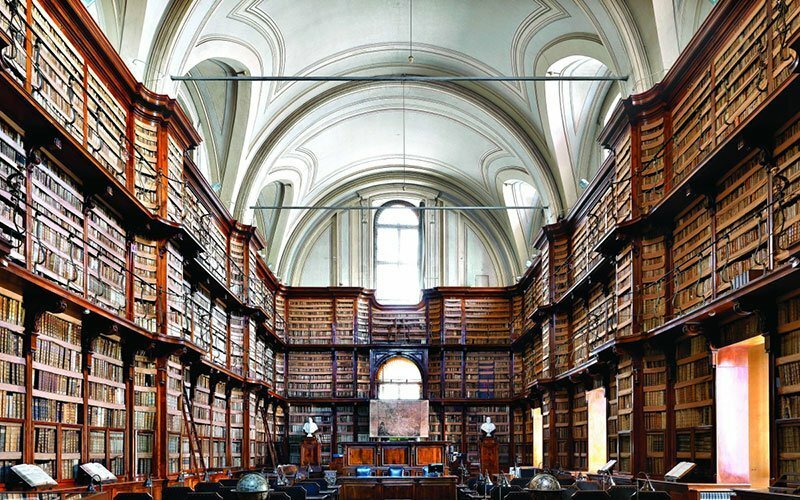 The place is called l’Anamorfosi del Convento del Sacro Cuore” right next to the Church of Trinità dei Monti. Anamorfistic is said of an image in which the subject may only be perceived by looking at it from a specific angle. To admire it, you should enter one of the upper galleries of the cloister where you will find a large painting of St.Francis of Paola. As you will walk alongside the painting and reach its middle, it will transform itself magically revealing a bucolic scene. Your journey will end in St.Peter’s Square amongst Papal vestiges and works of art that have made history. There is much more to Rome of course and other great itineraries await.